Microsoft simplifies licensing, promotes data center standards for public, private cloud. Thank goodness for small favors and for seeing the bigger picture. Microsoft on Tuesday unveiled System Center 2012 RC1, which it said will reduce the number of licensing options associated with its server tools from more than a hundred to just two. That's the small favor. Seeing the bigger picture, Redmond has also revealed that its server management platform will be able to control not only Hyper-V-based guest systems, but those running hypervisors on Citrix XenServer, as well as VMware servers. "The data center is like the Wild West; there are no standards and no consistency," said Brad Anderson, corporate vice president of the Management and Security Division of Microsoft, in a confidential briefing for reporters and analysts last week. This lack of standards is particularly true of smaller companies, he said, where IT administrators must often detour around corporate roadblocks to get their job done. "We know companies will have a hybrid of systems... They might have &#91;compute resources&#93; from Amazon here, and &#91;something else&#93; there." About 20 percent of the organizations using System Center are managing Linux-based servers in addition to Windows, Anderson said. So the decision to manage competitive hypervisors seemed natural, and drove a larger point about Microsoft's ongoing strategy to provide consistency for customers by adherence to standards. Microsoft's simplified licensing plan incorporates Application Controller, Endpoint Protection and Manager components for Configuration, Data Protection, Operations, Orchestration, Service, Virtual Machine into just two SKUs that are identical except for their supported operating system environments (OSEs, a physical or virtual instances of Windows). Listing for around $1,300 is System Center 2012 Standard, a two-socket license that supports two OSEs. By far the better deal is System Center 2012 Datacenter edition, which lists for around $2,600 for a four-socket version with no limit on OSEs. "Organizations want to increase their use of virtualization and not be penalized," said Anderson of the pricing strategy, comparing it to that of a cell phone. "We all want unlimited data plans on our cell phones, and that's essentially what this is. You can scale to as many images as you want and costs will not increase. That's very different from VMware." Of the eight components now included with System Center, two are new in 2012, and provide functionality that's largely the result of acquisitions. App Controller gives administrators the ability to copy or move .NET applications from one OSE to another with a simple drag and drop. "We still use App-V, which understands the relationship between the application and the OS and puts it in a bubble," explained Anderson, but technology acquired with SoftTricity in 2006, envelops the app and its files and allows it to be moved with a command similar to XCopy. "Then a larger bubble creates a virtual instance of that app that can be moved around," he said, and permits the app and operating system to be updated independently. The capability will eventually be extended to native (non-.NET) apps as well, Anderson said. Thanks to integration of technology acquired in 2010 with app monitoring startup AVICode, IT admins and help desk staff can gain deeper insight into troubled applications. "IT gets a view into performance of apps to show the SQL calls that are taking the longest time from end to end user perspective," said Anderson, for example. "Now System Center can drill down into apps and call development with actual SQL calls to resolve issues." The other new component is Orchestrator, which implements features acquired in 2009 along with process automation company Opalis. Among its many capabilities, Orchestrator permits administrators to automate the creation and deployment of system services, to automatically monitor usage and to automate numerous workflow tasks among System Center modules and with third-party applications. 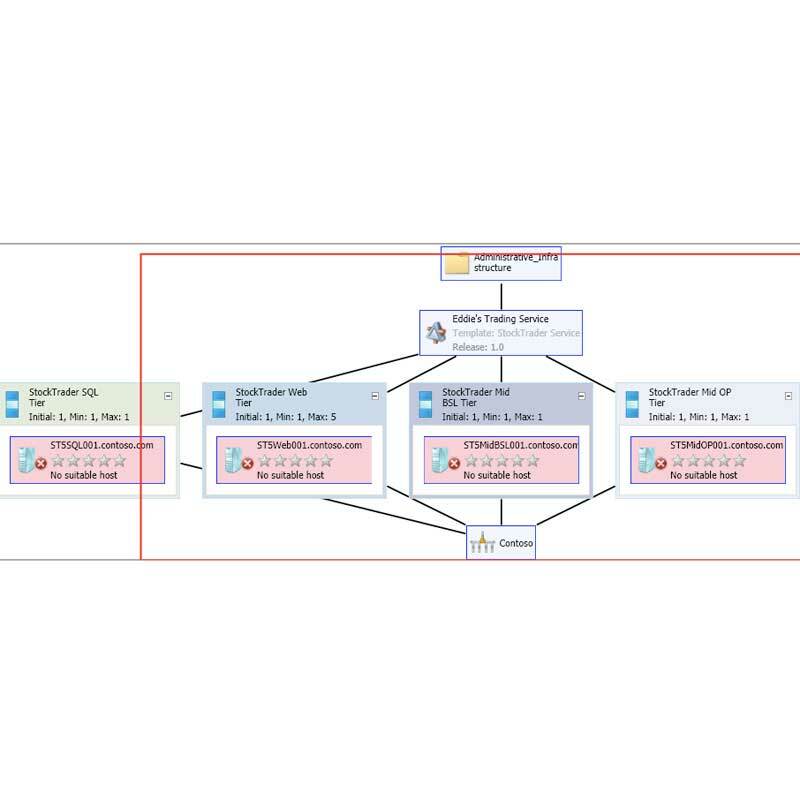 A drag-and-drop interface creates custom workflow "runbooks" with no coding, and a new publish-and-subscribe "data bus" provides a simple mechanism for making new workflows known and for facilitating inter-module communications. Microsoft further simplifies life for IT admins and users alike with System Center 2012's self-service capabilities, which lets IT create "service offerings" that end-users can built to suit their application needs and schedules within the resource limitations set up by IT. "This allows IT to be in control of underlying infrastructure, but gives app owners the opportunity get services faster," without the tension between techies and the business side. System Center 2012, now available for download as a release candidate, represents Microsoft's overarching private cloud strategy to give IT departments more than a simple, cost effective infrastructure for multi-vendor virtual machine management, but one that also facilitates the simplified deployment and management of multi-tiered applications and user-activated services hosted "in the cloud."